This sample of Whipnose, a hopped whiskey from some outfit called the Seven Stills of SF, seems to represent a new low, or high, depending on your point of view, in Sku’s career as a perpetrator of avant garde sample bottle labels. As you can see this one doesn’t even have a label; instead, Brakhage-style, Sku has written the name directly on the bottle. And he has chosen a colour that is all but impossible to read and has written the name vertically down the bottle in a free, almost baroque script. I put it to you, however, that this in fact is a complex text, worthy of analysis in and of itself. This is the third, and probably last for a while, of my reviews of easily found mass market blends (see here for the Black Label, which I liked a lot, and here for the Famous Grouse, which I did not like a lot). 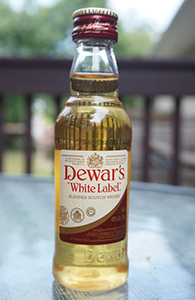 Unlike the Black Label and the Famous Grouse, I have never previously tasted the Dewar’s White Label (unless I have and have suppressed the memory). Owned by Bacardi, this White Label is claimed by them to be the top-selling blended Scotch whisky in the US. Then again, the Famous Grouse is claimed to be the top-selling blend in Scotland. I don’t know too much about Irish whiskey (as I have noted before). 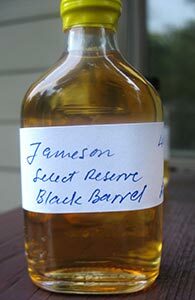 I believe this Black Barrel is a blend like the regular Jameson, though priced a rung above. Indeed, a quick glance at the official website confirms this. It also informs me that this is matured only in ex-bourbon barrels–whereas the regular Jameson seems to be from bourbon and sherry casks–and contains a larger proportion of pot still whiskey in the blend; and like all Jamesons this is triple-distilled. The barrels would seem to be charred more than usual a la the Ardbeg Alligator (hence the name, I suppose). Let’s have at it.